Even when investors abide by tried and true principles, success in the markets is hard because history never repeats. For example, value investing—buying stocks that are cheaper than the overall market—has been a winning strategy for much of the last century, as the graphic shows. Yet for much of the post-crisis era, growth investing has prevailed, thanks largely to technological innovation in the digital economy. Buying cheaper has not kept pace with chasing trends. Thus, investors have not been rewarded for contrarian thinking in years. Because these cycles cannot be timed, however, a broadly diversified portfolio across investments styles remains the prudent course. 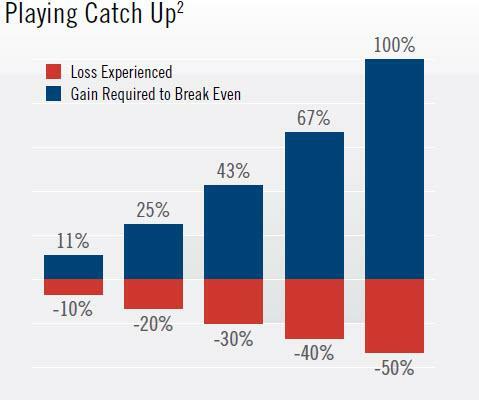 It’s easy to lose sight of the fact that drawdowns require disproportionate gains to get back to even. Smart risk management must consider the mathematics of recovery. A diversified portfolio returned 1.4% in Q2. REITs sharply rebounded with a 10.0% gain. U.S. small caps also surged by 7.7%. However, international stocks, especially emerging markets, declined. For the year, a diversified portfolio is basically flat. Bonds have generally struggled. The bellwether Bloomberg Barclays U.S. Aggregate Bond Index is in the red for 2018 so far. Longer-dated bonds have led losses as interest rates have risen. Across all the company sizes—large, mid, and small—growth stocks far exceeded value stocks year to date. Consumer cyclicals and technology led while consumer staples lagged. 1Monthly Data 1/31/1950–4/30/2018. Source: Ned Davis Research. © 2018 Ned Davis Research, Inc. Further distribution prohibited without prior permission. All rights reserved. See NDR disclaimer at www.ndr.com/copyright.html. For data vendor disclaimers refer to www.ndr.com/vendorinfo. Data source: Kenneth French Data Library. The book-to-market ratio is used to find the value of a company by comparing its book value to its market value. Book value is calculated by looking at the firm’s historical cost, or accounting value. Market value is determined in the stock market through its market capitalization. 2The chart is a mathematical example. It is for illustrative purposes only and is not indicative of the performance of any Virtus investment. Index Definitions—The S&P 500® Index is a free-float market-capitalization weighted index of 500 of the largest U.S. companies. The index is calculated on a total return basis with dividends reinvested. The Russell 2000® Index is a market capitalization-weighted index of the 2,000 smallest companies in the Russell Universe, which comprises the 3,000 largest U.S. companies. The MSCI EAFE® Index (net) is a free-float-adjusted market-capitalization weighted index that measures developed foreign market equity performance, excluding the U.S. and Canada. The index is calculated on a total return basis with net dividends reinvested. The MSCI Emerging Markets Index (net) is a free float-adjusted market capitalization-weighted index designed to measure equity market performance in the global emerging markets. The index is calculated on a total return basis with net dividends reinvested. The Bloomberg Barclays U.S. Aggregate Bond Index measures the U.S. investment grade fixed rate bond market. The index is calculated on a total return basis. The Bloomberg Barclays Global High Yield Bond Index is a multi-currency flagship measure of the global high yield debt market. The index represents the union of the US High Yield, the Pan-European High Yield, and Emerging Markets Hard Currency High Yield Indices. The high yield and emerging markets sub-components are mutually exclusive. Until January 1, 2011, the index also included CMBS high yield securities. The index is calculated on a total return basis. The Bloomberg Barclays U.S. Treasury Bill 1-3 Month Index includes all publicly issued zero-coupon U.S. Treasury Bills that have a remaining maturity of less than 3 months and more than 1 month, are rated investment grade, and have $250 million or more of outstanding face value. In addition, the securities must be denominated in U.S. dollars and must be fixed rate and non convertible. The Bloomberg Commodity Index is composed of futures contracts on physical commodities and represents 22 separate commodities traded on U.S. exchanges, with the exception of aluminum, nickel, and zinc. The FTSE Nareit Equity REITs Index is a free-float market capitalization-weighted index measuring equity tax-qualified real estate investment trusts, which meet minimum size and liquidity criteria, that are listed on the New York Stock Exchange, the American Stock Exchange, and the NASDAQ National Market System. The index is calculated on a total return basis with dividends reinvested. The indexes are unmanaged, their returns do not reflect any fees, expenses, or sales charges, and they are not available for direct investment. Not all products or marketing materials are available at all firms.